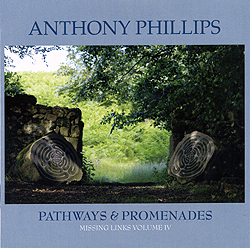 Anthony Phillips has an extensive output as a recording artist. As well as album releases such as The Geese And The Ghost, Wise After The Event and Slow Dance, he has to date also released ten albums in the Private Parts & Pieces series and three volumes in the Missing Links series. In addition, he�s written and recorded tracks which have only ever been released on compilation albums. Over the years these compilations have gone out of print, yet demand for Anthony's contributions to them remains high. Now the fourth volume in the Missing Links series - Pathways and Promenades - brings together these sought-after pieces on one collection for the first time. Complementing them are some choice tracks from Anthony's prestigious output of Library material which receive their first commercial release here alongside the previously unreleased track Halycon Days.